Tiffany & Co. Authentic Italy Ruby Flower Pin Brooch in 18k Y Gold Size 2"
MARKED: Tiffany & Co 18K Italy. We specialized in GIA certified diamonds and Gemstones. Elsa Peretti 925 Sterling Silver Pin / Brooch. 2.25" in length and 1" wide. total weight is 10.1 grams. Tiffany & Co. Sterling Silver Paloma Picasso Loving Heart Brooch . Condition is Pre-owned. Does not come with a box or pouch. Does have scratches and scuff from use. Will need a jeweler to make it look new again. It is 1 1/3 inches tall and weighs 10.2 grams. Please review pictures. If you have any questions please ask. We combine shipping. Please wait for an updated invoice before paying. Shows small scratches from normal wear see picture and use them as description Vintage Rare Signed Tiffany & Co Star Pin 925. Condition is Pre-owned. Shipped with USPS First Class Package. 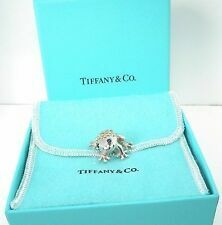 Ending Wednesday at 7:38PM PDT1d 13hBrand: Tiffany & Co.
Weighs 3.8dwt. Hallmarked 18k Tiffany & Co. In great condition, see photos! We stand behind all our products to be as described. Pouch included. Very good pre-owned condition. Elsa Peretti 925 sterling silver pin. Marked 1983 Tiffany & Co. Peretti 925 on the backside. Quarter to show size. 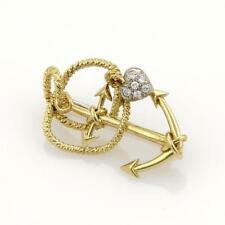 18k Tiffany & Co. Fraternity Badge & 14k Pin. Sigma Chi Cross = 2.7 Grams 18k. Cute teddy bear with eyes in ruby and a diamond on the stomach. -Tiffany teddy bear brooch in 18k yellow gold. Style Scribble. Paloma Picasso. Markings Tiffany & Co. Purity 925. Material Sterling Silver. 100% Authentic. Tiffany & co RARE VINTAGE STERLING SILVER MARIGOL NATURAL FLOWER BROOCH PIN! Authentic Tiffany & co.Sterling silver marigold nature flower brooch pin! Engraving: TIFFANY & CO. 925. Include Tiffany & co. box! Ready to wear or gift 🎁. Weight: 12.0 grams total weight. Hallmark: c 1991 Tiffany & Co Sterling Paloma Picasso. Information regarding item(s) listed is supplied to Gold and Silver Brokers by prior owners; however, the information is researched or verified by Gold and Silver Brokers to the best of our abilities. This is a very fine and rare sign 18K Tiffany & Co. yellow gold with rubys and diamond brooch with unique opening and closing of one of the diamond flowers.15ct surronded by 14 round fine rubys. It weighs 24.6 grams, in excellent condition. Marked TIFFANY & CO / STERLING and weighs 2.16 grams. Sterling Silver 925 "God Loves You" Pin/Lapel Pin/Tie Tack. This Pin is in Very Good Pre-owned Condition. Photos are of actual item that you will be receiving. 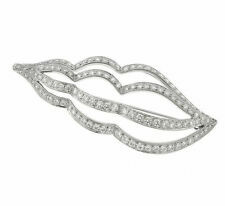 Don't Miss A Great Opportunity to Buy A Tiffany & Co. Brooch Pin! It Will Be A Perfect Gift For Anyone or Yourself! Made By Tiffany & Co. Made Of Solid 18k Gold And Rubies. Hallmarked And Signed. VERY RARE AND DIFFICULT TO FIND. Ending Saturday at 8:17PM PDT4d 13hBrand: Tiffany & Co. This is a Sterling silver pin with 18K plating. The back of the pin is shown on the pictures. Length 2-1/4". It is brand new and comes with a pouch and a box, also a white ribbon. I believe that this pin was made sometime ago and was never used, however tarnished a little in the box. I can have it professionally cleaned if needed. Please feel free to ask any questions. I ship promptly, except for weekends. The box in the picture may not be the same as you receive because I have two if these pins. Tiffany & Co. Sterling Silver American Flag Lapel Pin . Condition is Pre-owned. Shipped with USPS First Class Package. VINTAGE TIFFANY AND CO. STERLING SILVER "TURTLE" PIN, MINT, NEVER WORN, DISCONT. The turtle pin was part of a suite of jewelry sold by Tiffany until the late 90's when it was discontinued. (I still own the bracelets and the necklace...) The pin measures 1.25 ins side to side and top to bottom from leg to leg. The pin was never worn. It's in pristine condition. It's signed on the back. This piece is extremely rare. Only one on eBay. Similar design in pillboxes and earrings list for over one-thousand dollars. LOW STARTING PRICE. THIS IS A BARGAIN PRICE FOR SUCH A HIGH QUALITY PRODUCT! THIS ITEM WOULD MAKE A PERFECT GIFT OR ADDITION TO YOUR COLLECTION!! BARGAIN PRICE. NO RESERVE!! Marked: 14k Tiffany & Co Germany. Large Selection of Diamond and Fine Jewelry. Hallmark: Tiffany Italy 750. Diamond and Ruby Flower Pin Brooch. Tiffany & Co.
18k and Rubies Brooch. # of Rubies: 11. Size of Rubies: 2.25mm each. Tiffany & Co.
Preowned and stamped Authentic Tiffany & Co elsa peretti 750 SPAIN. Full heart pin brooch. 6.5 grams total weight. The pin is marked on the back 14k Tiffany & Co. It is in very good pre owned condition. The pin weighs 4.2dwt. The wings are yellow gold and textured, the antennas are yellow gold and the body is platinum and set with 5 full cut diamonds with an estimated total weight of. 10ct. The wing is stamped Tiffany & Co. 750 and the body is stamped PT 950. Tiffany & Co. A large cabochon onyx center stone is set into a solid 18k yellow gold head atop the sterling silver body of this pin. Stone: 16x12mm oval cabochon onyx. The front says "The Brooklyn Hospital Training School For Nurses". On the back it is engraved D. Forster Sept. 1943 and has the mark "Tiffany & Co Makers 14KT Gold and the letter m". It also has 14K on the pin clasp. The stone is Ruby, it is 3mm north to south and 3mm east to west, approx carat weight is 0.10, total approx carat weight of all stones is 0.28. It is fully hallmarked, tested, and verified weighing in at 10.9 grams. Hallmark: 1.7k. Weight: 8.30 DWT. Up for your consideration is a beautiful Authentic Tiffany & Co. 14K Yellow Gold Wing Pin/Brooch. 3mm in depth. The brooch has a total weight of 4.4 grams. Blue Pouch and Box. We look forward to hearing from you soon! In Excellent Condition including Tiffany felt box. Stamped:750 (C) TIFFANY & CO. 1.7" long by 5/8", 6 grams in weight. Tiffany & Co. Hallmarks: Tiffany & Co. Paloma Picasso 925. Other: Tiffany box is included. Yellow gold Cat & Fish brooch. This authentic Tiffany & Co. brooch is in excellent pre-owned condition. The brooch is in working condition. Markings: "Tiffany & Co. © 1991" and "Germany 750" located on the back of the brooch. 14K Yellow Gold Tiffany & Co. Diamond Rose Floral Pin / Brooch. Marked: Tiffany & Co 14k. 14K Yellow Gold. This pin will add value to your collection! Don't miss out! Pin has been cleaned and inspected. From their 1986 “ Back to Glamour” collection, this beautiful Tiffany & Co. sterling silver double circle pin is decorated with two deep blue sapphires set in 14k gold. Marked “Tiff&Co STR 14K”. Princess cut natural blue sapphires of approx. Hallmark: Paloma Picasso, Tiffany &Co., 750. In Tiffany Box and Pouch. Item in the pictures is exactly what you will get. Size is approx. AUTHENTIC TIFFANY & CO STERLING TRIPLE HEART BROOCH W/ BOX! AUTHENTIC TIFFANY BROOCH. @ Tiffany & Co. BEAUTIFUL TRIPLE INTERLOCKING. OPEN HEARTS IN STERLING. 1 3/4" across. Hallmark: TIFFANY & CO. / PT950. Tiffany & Co. With the very nice clarity and color synonymous with Tiffany & Co. Victoria Sapphire & Diamond Circle Pin. Made in Platinum. Features 12 round brilliant cut natural sapphires that weigh about. 60 ct total weight. Authentic beautiful Tiffany & Co 18K yellow gold Dolphin pin or brooch! Stamped Tiffany & C0 750 1991. It features a approx 3 point diamond in the dolphins mouth as well as a small blue sapphire in the eye. Yellow gold playful cat brooch. stationed at the cat's paws is a genuine round brilliant cut diamond bezel set in white gold. This authentic Tiffany & Co. brooch is in excellent pre-owned condition. Marked 18k Tiffany & Co. We test all gemstones with a Presidium Gem Tester. Many gemstones' properties overlap and could potentially be one of many variety of gemstones. Our Testing Process. Has toning on it - needs polished.